Gain full access to the most critical updates in the International Building Code®, including the real-world application of those changes and how they originated — all in a single, easy-to-use resource. 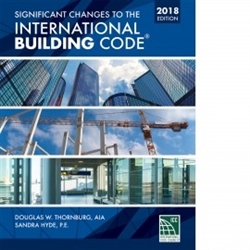 SIGNIFICANT CHANGES TO THE INTERNATIONAL BUILDING CODE® 2018 Edition provides a comprehensive analysis of significant changes since the 2015 IBC ®, offering key insights into its contents and implications. Coverage includes changes made to both structural and non-structural provisions. Each change analysis features the affected code sections and identifies the change with strikethroughs and underlines to show modifications to the existing language. Each change is accompanied by a quick summary, detailed illustrations, and discussion of its significance, which brings the technical jargon of the code to life in a real-world setting. The attention to detail, logical organization, and thorough yet concise coverage found in this resource make it an ideal tool for transitioning from the 2015 IBC®.